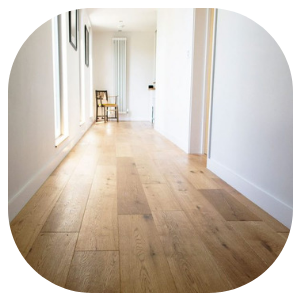 At Bramley Carpets we have an array of wood and laminate floors available from many leading manufacturers such as Quick-Step, Balterio and V4 Wood Flooring. Our extensive range of products are available in various colours, designs and textures from classic herringbone's, elegant tiles and luxurious wood effect planks that have all been produced to the highest standards and are backed with lengthy guarantees. In store we offer all our customers friendly and helpful advice along with a take away sample service to make choosing your Wood or Laminate floor a stress free process. We also offer a professional installation service from one of our teams of experienced floor fitters, so why come visit us today and see our huge selection of products for yourself. 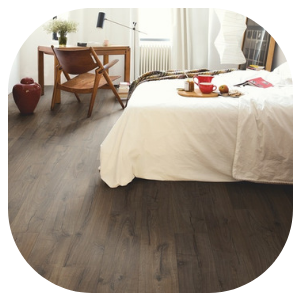 Price- If you're on a budget then laminate flooring could be a great option for you. Not only are the products great value but installation costs can be less expensive than other floor coverings. Cleaning- Most products have a protective coating that prevents spills and stains from penetrating the surface when acted upon quickly. The simple use of a damp cloth or mop will remove most dirt efficiently. Durability- Laminate flooring can be extremely durable with many products having protective wear layers and water-resistant joints meaning they will last for many years to come. Non-Allergenic- Naturally resistant to dust, mites and dirt, laminate flooring is a perfect choice for allergy sufferers. Designs- Gone are the days of laminate only being available in wood effect planks. Many options from stone effect tiles to unique abstract designs are now available. Natural Product- Unlike many other floor-coverings, wood flooring is completely natural and our manufacturers have reforestation projects in place to continue with the growth of trees. Choice- Available in some of the most beautiful colours and finishes, wood flooring can be smooth, textured and un-finished leaving the final decision up to you. Underfloor Heating- Wood floors can be installed over underfloor heating. Non-Allergenic- Unlike carpets, wood floors are solid so do not inhabit dust mites and dirt. Versatile- The option to sand and refinish your flooring is a wonderful choice to have, so whether you are tired of the colour or just fancy a change the options are endless.